With the Nexus 6 available to a handful of users, renowned developer Chainfire has released his famous CF-Auto-Root script for the device allowing even the most novice of users to root Android 5.0 Lollipop in no time at all. It wouldn’t be the first time that an Android device has been rooted, having witnessed several ones in the past. The Nexus tag makes things even easier, with a walk in the park bootloader unlock method and some boringly easy root methods. Well, here’s one for your latest Nexus 6. Note: This root method will also unlock your Nexus 6’s bootloader if it is locked, and you will lose all data, so be sure to back it all up. You risk losing your warranty as well. Download the CF-Auto-Root zip file for the Nexus 6 from here. A USB cable to plug your Nexus 6 to the PC or Mac. 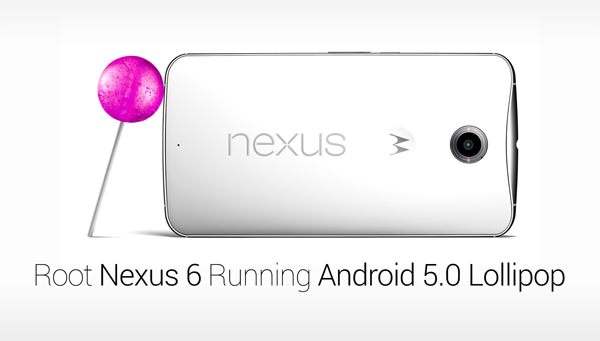 Completely back up your Nexus 6. Follow our: How to completely backup your Android device on PC without root access guide on how to do so. Step 1: Download the CF-Auto-Root zip file and extract the contents to a folder. We prefer placing these files on the desktop for easier access. Step 2: Power off your Nexus 6, and boot the device into bootloader mode. To do so, hold down the Volume Down button and the Power button. Step 3: Once you see the “Restart bootloader” message on the phone, let go of the keys and tap “Restart bootloader” to enter bootloader mode. Step 4: Plug in the Nexus 6 to the PC or Mac and navigate to the location of the extracted contents. Step 5: Now we need to run the automated root script. Simply run the “root-windows.bat” file. Step 6: You will be prompted on the computer to unlock the bootloader if it’s still locked, so go ahead and hit the Enter / Return key even if you’re unlocked. Let the script run, and in a few seconds you should see it running on your Nexus 6 telling you that the device is being rooted. Once the script has done its part, your Nexus 6 should reboot automatically. The rooting procedure should only take a couple of minutes at most. Now we need to confirm that your device has actually been rooted. Simply check your app drawer for an app called SuperSU, which will confirm whether the script has rooted your device or not. will this work around the at&t locked sim? will it work at other android devices ?